Two faculty members at the SUNY College of Environmental Science and Forestry (ESF) have received SUNY's highest faculty honor. 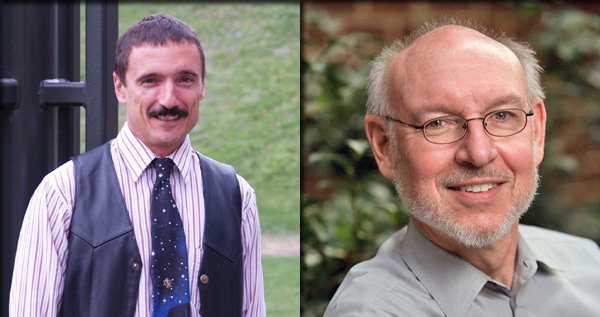 Dr. Russell Briggs was appointed a Distinguished Teaching Professor and Professor Richard S. Hawks was appointed Distinguished Service Professor. Briggs and Hawks were among 19 faculty members from the 64-campus system who were added to the distinguished ranks by the SUNY Board of Trustees. Candidates for Distinguished Service Professorship must have demonstrated substantial distinguished service not only at the campus and the State University, but also at the community, regional and state levels. In announcing the award, SUNY noted Hawks, professor and former chair of ESF's Department of Landscape Architecture, has provided decades of service to ESF, the SUNY system, national organizations such as the Trust for Historic Preservation and the American Society of Landscape Architects (ASLA), and communities and institutions nationally and internationally. He has served as president of the Council of Educators of Landscape Architecture (CELA), vice president of ASLA, and is a Fellow of ASLA and CELA. He serves as the only permanent academic on the CEO Roundtable, an organization of leading landscape architecture design firms. Hawks created the Citizen's Institute on Rural Design, which he co-directed for 23 years to produce more than 60 workshops for rural community leaders on the importance of planning and design in community success. He has received a number of national awards for his contributions to the profession and to the public. The Distinguished Teaching Professorship recognizes and honors mastery of teaching. The designation gives Briggs, a professor in the college's Faculty of Forest and Natural Resources Management, an academic rank above that of full professor and recognizes faculty members who have demonstrated superior mastery of teaching skills, scholarship, professional growth, student services, academic standards and evaluation of student performance. Briggs joined the ESF faculty in 1995, having earned his Ph.D. at the college 10 years earlier. He is a professor of forest soils, director of the Division of Environmental Science, and director of the Forest Soils Analytical Laboratory. Briggs' areas of expertise are forest soils and silviculture. He is held in high regard by his peers for both the diversity of courses he teaches as a divisional director and the joy and enthusiasm he brings to his daily work. Briggs is an outstanding researcher who is active in the Soil Science Society of American and the Society of American Foresters. He has held leadership positions in both organizations and was recently selected to serve as division chair within the Soil Science Society. He has authored or co-authored with his students more than 70 articles for these professional societies. He has served as an associate editor for two national/international journals in the field and has helped numerous graduate students and young scientists publish their first manuscripts and begin their professional careers. Briggs has consistently demonstrated a commitment to training future generations of forestry professionals. His past students attest to the impact he has had on their lives. For many, being in his class is a life-changing event; several emphasize that new career options opened for them because of Briggs' inspiration. He is generous with his ideas and shares credit willingly with colleagues and students. "We are deeply proud to recognize our faculty with these prestigious rankings, and to have the opportunity to honor the work they do on behalf of the students, campuses, and communities they serve throughout New York State and around the globe," said SUNY Chancellor Nancy L. Zimpher. "Many thanks and congratulations to this most recent class of distinguished faculty." Since the program's inception in 1963, SUNY has appointed 994 faculty to distinguished ranks, as follows, including these most recent appointments: 337 Distinguished Professorships; 296 Distinguished Service Professorships; 356 Distinguished Teaching Professorships; and 5 Distinguished Librarian Professorships.